T/Sgt. Brooks R. Bolin, son of Mr. and Mrs. T. B. Bolin. 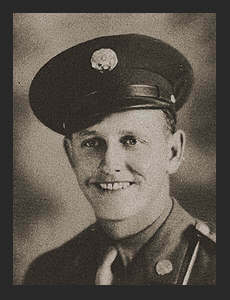 Entered the Army in Oct. 1940, trained in Ft. Russell, Camp Bowie, Texas; served in England, France, Belgium, Luxembourg, Germany, Czechoslovakia; was wounded in action in Luxembourg, Jan. 1945. Awarded the Purple Heart, Bronze Star, Good Conduct Medal, and ETO Ribbon with five Battle Stars.